Blizzard’s multiverse MOBA, Heroes of the Storm, is getting a new hero in the form of World of Warcraft’s Yrel. WoW fans will remember Yrel from the MMO’s fifth expansion, Warlords of Draenor. Starting out as a lowly temple acolyte, she was captured by orc forces but managed to break free of her captivity and go on to fight against the Horde. In time, she rose to become one of the game’s most significant heroes, leading the Draenei on behalf of the Alliance. Think of her as WoW’s version of Iron Man. Yrel is a paladin, billed as a deliberate melee warrior, whose heavyweight abilities reward premeditation and commitment. For example, her unique trait, Divine Purpose, allows her to charge her next basic ability at no mana cost. All of her basic abilities can be charged up over 1.5 seconds, increasing effectiveness, at the cost of her movement speed, which takes a 25% hit when charging. Looking for more arena battle action? Here are the best MOBA games around. Utilising her unique rhythm is key to finding success with this new hero. Her strong but slow attacks mean Yrel is best used as a tank, acting as an anchor for your team and driving back enemies. Yrel’s basic abilities favour defence, starting with Vindication. This unleashes holy energy around Yrel, dealing 38 damage to nearby enemies and healing her for 96. You can charge Vindication to drastically increase its effectiveness, upping the damage to 125 and healing for 320. Righteous Hammer and Avenging Wrath are more offensive abilities: the former boasts a knockback effect, while the latter sees Yrel leaping to an enemy’s location and slowing them. 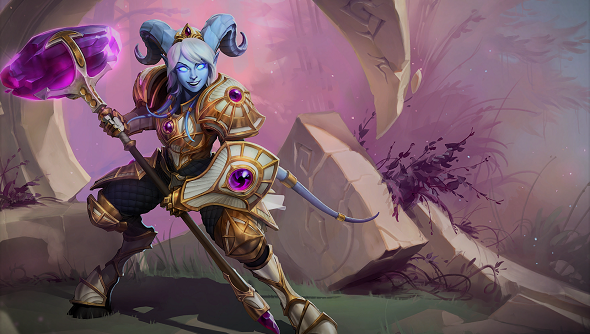 Ardent Defender is Yrel’s first heroic ability, which surrounds her in a barrier for three seconds, absorbing all damage taken and healing her for 50% of damage received. Sacred Ground sanctifies the map around her, gaining 40 armour until she leaves the area. Both of these abilities will be invaluable for pinning down or stalling attacking enemies. At level four, Yrel can use her talents to support her allies. Aegis of Light gives armour to allies in Avenging Wrath’s impact area, and Gift of the Naru allows Divine Purpose to heal a nearby ally. Hand of Freedom grants allies bonus movement speed and clears slows. Use these abilities to your advantage and you can expect to be the most popular player on your team in no time. Yrel comes as part of the Echoes of Alterac update, which will also add a new battleground, loot, quest lines, and more to the game. Yrel will enter the Nexus this summer, with the exact release date still to be decided.